Utilizing BitTorrent peer to peer technology and Really Simple Syndication (RSS) feeds, Videora automatically and intelligently finds and downloads video you want to watch. 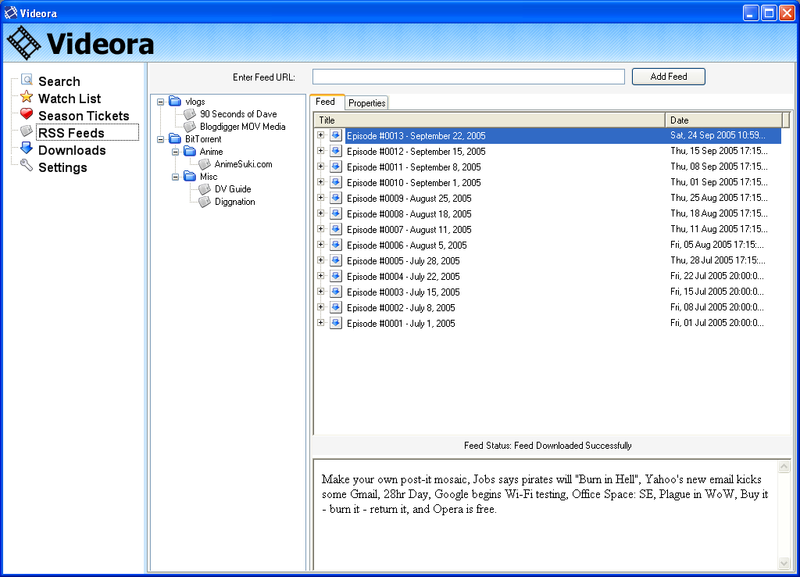 Videora 2.0 is the latest version of our new personal video downloading program. Utilizing BitTorrent peer to peer technology and Really Simple Syndication (RSS) feeds, Videora automatically and intelligently finds and downloads video you want to watch. With easy to use features like Watch Lists and Season Tickets you will be able to watch your favorite video, no matter where you are in the world. All you need to get started is a broadband internet connection and Windows.